Chicken is one of the most versatile meats you can buy. It goes with just about everything and most dishes are so simple and easy to prepare. The Chicken with Eggplant and Basil is one such dish. This dish requires 4 tablespoons extra-virgin olive oil, 1 baby eggplant cut in half, salt, 1 tablespoon pine nuts, 4 thin chicken cutlets, Freshly ground pepper, All-purpose flour, cloves garlic, chopped, 1/4 cup sun-dried tomatoes packed in oil, drained, rinsed and chopped, 1/4 cup fresh basil leaves, 1/2 cup chicken broth, 1/4 cup ricotta cheese, and bread. To prepare, first season the chicken with salt and pepper and roll in the flour. After shaking off the excess put aside. Next drizzle a little olive oil over the eggplants and add salt; place in an oven and cook for a few minutes. Toast the pine nuts over a saucepan over a high flame and then place in a bowl and drizzle the remaining olive oil. Place the chicken in a saucepan and brown for a few minutes add the garlic and cook a few more minutes. 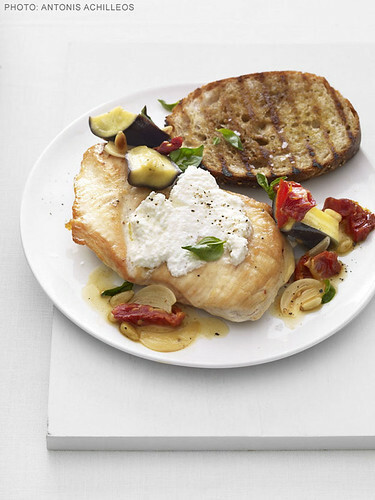 Slice the eggplant into chunks and add tomatoes, eggplant, basil, nuts, and broth to cooking chicken. Simmer. Allow to cook and top with ricotta cheese and eggplant. Serve with bread.